You would never brave a cold winter day, a powerful rainstorm or a bright sunny day without protection, would you? Probably not. Don’t let your asphalt driveway or parking lot, either. Sealcoating is a barrier that protects your asphalt driveway from the elements and improves asphalt durability and longevity. Understanding the benefits and best practices when it comes to sealcoating and the proper steps a reputable contractor will take to protect your investment, is important. The primary purpose of sealcoating an asphalt surface is to protect it from the deterioration that is caused by sun, water and car pollutants, like oil and gasoline. When asphalt is exposed to the sun, water and other compounds, the asphalt can oxidize and harden, becoming brittle and more likely to crack or break apart. A sealcoat application helps protect the asphalt surface, reducing water penetration and the harmful effects associated with UV rays and harmful car pollutants. 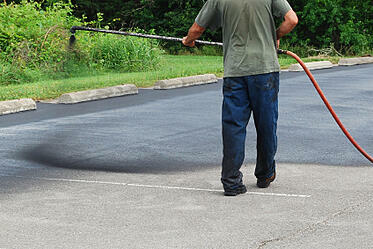 Sealcoating also gives a fresh, new look to your asphalt driveway or parking lot. An application of sealcoat will leave your surface looking like new, reducing facing and filling small cracks and minor surface damage. Moreover, a sealcoating application can save you money in the long run because you will protect the surface, extending the lifespan of the asphalt. Evaluate the surface. The first task for any contractor is to evaluate the current state of your asphalt surface. If it is a new surface, you will not require sealcoating for 12-24 months. If it is an existing surface, a contractor will look for cracks, potholes, oil stains or other damage that might need repair before a sealcoat application. Clean the surface. Using brooms, brushes or power washers, the asphalt surface will need to be cleaned thoroughly to ensure the sealcoat can bond effectively. This is also important because all cracks, potholes and damaged areas will need to be cleaned as well, before repairs can begin. Identify cracks and repair, as needed. Whether they are cracks, divots or depressions, they should be filled with an appropriate aggregate mix to ensure extended asphalt integrity and durability. Pothole repair. Potholes should be repaired or patched prior to sealcoating to ensure the surface is looking and operating at its best. Clean oil spots and surface priming. It is important to remove oil stains from asphalt before sealcoating because the sealcoat will not stick to vehicle pollutants of any kind. If you are unable to remove the stain, consider using a primer agent, which much like wall primer, will allow the sealcoat to stick to the asphalt surface. A sealcoat application should not be completed unless the pavement temperature is at least 50 degrees with an air temperature above 50 degrees and rising. Sealcoating applied in other weather conditions could result in poor application and a shorter protective time period. Typically, an asphalt surface will require two sealcoat applications initially, to penetrate the surface and result in a deep, protective coating. Every 2-3 years thereafter, an additional sealcoating application will help improve surface appearance and maintain the lifespan and durability of the asphalt surface. Do you have any additional questions about sealcoating? Let us know in the comments, we’d be happy to answer them!